Most-Trusted Telecom Brand Bharat Sanchar Nigam Limited (BSNL) has announced re-launch of 3.6 Mbps 3G Data Card offer as backup to ADSL Broad Band connectivity at reduced sale price to the existing and new ADSL Broad Band Customers as a promotional offer for limited period across Karnataka Telecom Circle. The Competent Authority of Karnataka Telecom Circle has re-launched Start-up Kit (SUK-149) 3.6 Data Card offer under ADSL Broad Band Fixed Monthly Charges (FMC) and Annual payment customers or Longer period Commitment with any FMC plan for Karnataka Circle BSNL Customers. The bundled Free data usage of 1 GB is to be used within 30 days from the date of activation. Along with SUK costing Rs.149/- the customer has to load Plan Voucher Rs.51/- for the activation of Data Plan. Totally the customer has to pay Rs.200/- for the SUK as well as for the Plan Voucher – Rs.51/-. For ADSL Broad Band Customers under Annual Payment option or Longer period Commitment with FMC Plan. The bundled free data usage of 1 GB is to be utilized within 30 days from the date of activation. Along with SUK costing Rs.149/-, the customer has to use Plan Voucher Rs.51/- for the activation of Data Plan. Totally the customer has to pay Rs.200/- for the SUK as well as for the Plan Voucher, Rs.51/-. The Plan Voucher has to be activated through Easy Recharge (C-TopUp) only and the customers will get additional 200 MB free data usage to be utilized within 30 days along with one year validity. After the first month, the customers are required to recharge their data card at market operated rates offered by BSNL to all data customers. The above offer will be implemented and with effect from 03-08-2013 to 01-11-2013 (for 90 days). How to avail the above offer from BSNL Customer Service Center? On purchase of Start-Up-Kit (SUK) SIM Rs.149/-+Rs.51/- (Rs.200/-) from any BSNL Customer Service Center the customer will get a free data usage of 1GB + 200MB (to be utilized within 30 days) with validity for One Year (12 months). 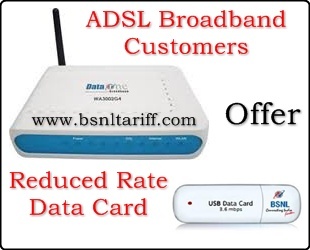 The 3.6 Mbps Data card will be available at reduced price of Rs.844/- or at Rs.527.50/- depending the nature of scheme of Broadband connection.